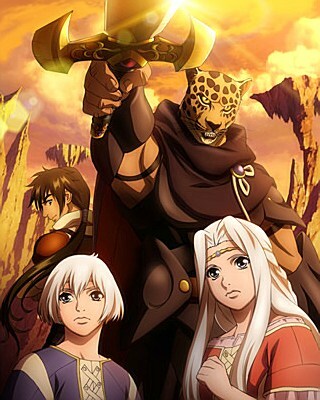 The North American anime distributor Sentai Filmworks has announced on Friday that it has acquired the Guin Saga fantasy television anime series from Satelight and Aniplex. The 2009 anime is based on Kaoru Kurimoto's epic 151-volume fantasy novel series. In this heroic adventure story, a strange leopard-headed warrior named Guin protects the twin royal heirs from the marauding Mongauli Army. A 164-second English-dubbed trailer is streaming on the anime's official Japanese website. Nobuo Uematsu, the composer famous worldwide for the Final Fantasy games as well as Blue Dragon, scored the Guin Saga anime's soundtrack. Atsushi Wakabayashi made his directorial debut after creating the designs for The Twelve Kingdoms and Yu Yu Hakusho and overseeing the animation in Ghost in the Shell: Stand Alone Complex and Naruto. Vertical has published the first five Guin Saga novel volumes and Hajime Sawada's manga adaptation in North America. The novel series has sold over 30 million copies in Japan. Kurimoto received a special award from The Science Fiction & Fantasy Writers of Japan after passing away last June. The Nebs blog had reported that Aniplex had inadvertently revealed this anime's acquisition during its Chicago Comic & Entertainment Expo panel on April 18. AWESOME!! i know i am getting this how about you mappy?